Though the title of Ashley Coolman’s blog posting out at smartsparrow.com mentions technology in it, the article is largely not about technology at all — but rather about the benefits of active learning. That’s why I’m highlighting it here. To many, it seems as though any learning can be considered active. Is a student taking notes not actively engaged in a class, especially when compared to their peers sleeping or playing on their phones in the back of the room? The problem here is that while the note-taking student may be engaging with the class and professor, they are not engaging with the material. When furiously scribbling notes, students are more focused on getting every word down rather than evaluating, understanding, and analyzing what it is they are writing. They have engaged with the lecture, but not the material being relayed — which is the most important part. It is the degree and form by which students are actively engaging that matters. It is “learning by doing” that students really need. Active learning is any learning activity in which the student INTERACTS or ENGAGES with the material, as opposed to passively taking in the information. A tool like Socrative may come in useful here. The problem is that lecture-based learning is not like filling a jug — you just don’t catch it all. Learning from lectures is more like holding out your hands and trying to keep the imparted knowledge from spilling through the cracks in this tidal wave of new information. Ultimately, students will catch some of the water, but most of it will be lost. If you doubt the immediately preceding quote, see if you can *fully* recall exactly what last Sunday’s sermon was about — including all examples, details, and wisdom that the preacher was trying to relay. Ultimately, it’s about impact. What strongly impacts students stays with students — and isn’t that true for all of us? Where’s the evidence that active learning works? 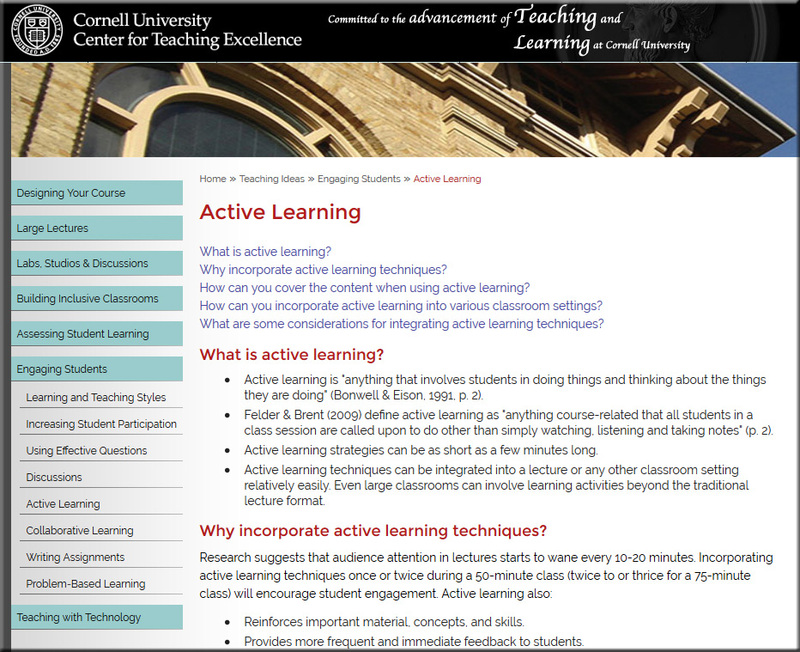 How Does Active Learning Support Student Success?